home to cattle, hogs, goats and chickens, all raised naturally. Far Away Farm's central location is only 1.2 miles from the Country Corner. The 48 acre farm located there is home to Hereford cattle, Boer goats, chickens and hogs all raised naturally for the consumer. From the day an animal comes to the farm to the day it is harvested we strive to raise them in the best environment and feed as much grass as possible. Far Away Farm has a branch farm in Elverson. Here we graze cow-calf pairs and steer during the summer. After the goats kid out in the spring this farm becomes their home. At this 100 acre farm corn, soybeans, wheat and alfalfa is grown and used for feeding the animals on both farms. In growing these crops the least pesticides are used. Corn silage is also produced from the corn raised here, this is one of the primary sources of feed for our cattle. Far Away Farm is home to a small show string. Each of George and Jean's four children have shown 4-H projects on a local, state level and even a national level. 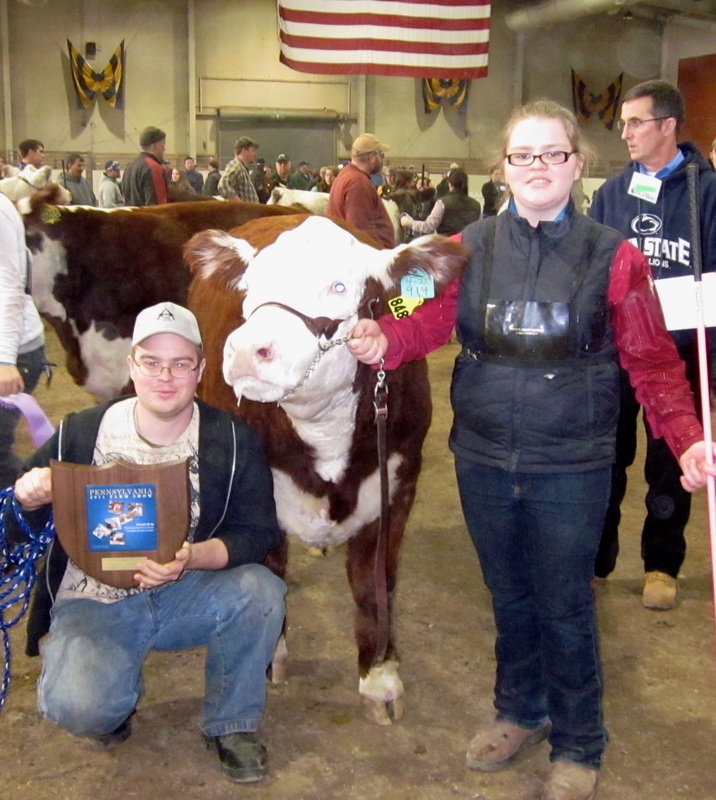 In January of 2011 Emily won Champion Hereford Steer at the Pennsylvania Farm Show! During the summer Far Away Farm raises hogs. Some of these pigs are raised as 4-H project animals so they are raised with the best of respect and care. This includes keeping them in an open environment and feeding them a natural plant based feed without synthetic growth hormones or antibiotics. These hogs also are walked daily to help them develop more muscle tone. Four years ago Far Away Farm welcomed 10 goats. They are now enjoying their third kidding season with a total of 5 kids so far this year, and more to come. Far Away Farm is also home to a flock of laying hens which are raised free range to produce eggs. Each chicken averages 1 egg a day. This may not seem like much but the size of some of the eggs we see are HUGE! During the year Far Away Farm also raises broiler chickens. These chickens are fed a plant based food which has no synthetic hormones or antibiotics added. At Far Away Farm we strive to raise every animal naturally and with extreme care. Now that Far Away Farms Country Corner is open, the beef, pork and poultry are all be sold in store front and are also being used in breakfast, lunch, and bakery items. Here at Far Away Farm we strive to raise "all-natural" animals so that we can provide you with the best meat and eggs around. We classify our meat as "all natural," however we go above and beyond the regulations and hit many of the organic regulations, such as, unrestricted access to the outdoors and never ingesting any animal byproducts. By definition, organic beef is raised all organically. From birth to harvesting each animal must be fed 100% US Organic grains and grasses. Antibiotics and synthetic growth hormones are restricted from organic beef. Organic beef must have unlimited access to the outdoors. Feedlots with many animals, and little acreage regularly put antibiotics in their feed to keep their animals from spreading disease. Most of those animals are injected with synthetic hormones. We are not a feedlot. 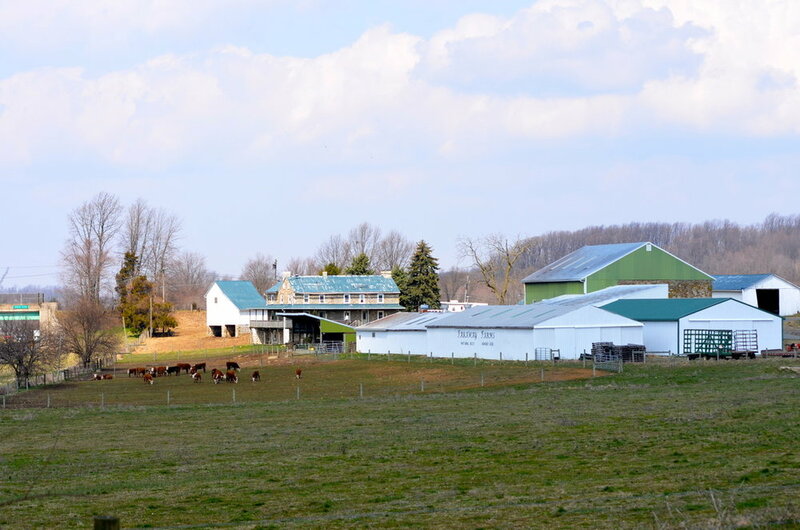 Our cattle graze on many acres of pasture on our two farms. They are supplemented with grain, grown on our farms with the least amount of pesticides possible. The only time any animal receives antibiotics is to keep it safe. If the animal becomes sick and the only way to help the animal recover is to give it antibiotics- we do so, we feel it is more important to be humane and keep our animals healthy then to let them suffer without medications. According to the definition of natural beef, the main differences lie in the harvesting process. Natural beef is processed without flavorings, colorings, preservatives or synthetic additives. Regulations do not address their food or environment; there are no requirements that the cattle have access to the outdoors. Hopefully it can be gathered from the information listed in this website that we take pride in what we feed our animals and the fact that our cattle have vast pastures and unlimited access to the outdoors. One thing that has not been discussed is the harvesting of the meat. As said above, when the meat is processed it is done without flavorings, colorings, preservatives or synthetic additives. All our meat is butchered at a USDA regulated facility. How and where is the beef sold? The beef is sold in the Far Away Farm Country Corner store. Each cut is sold by the pound. Do you sell beef quarters and halves? We only sell beef quarters at this time. These weigh about 100 lbs. You will receive about 30 lbs. of ground beef; the balance are cuts. Do you butcher your own animals or do you use a butcher off your farm? We do not butcher our own animals. Our animals are butchered and packaged at a U.S.D.A. certified facility. All meat comes vacuum packed. Our prices are always changing so please call or stop by the store for the prices. We raise Free Range chickens with unlimited outdoor access. Our chickens are cage free, all natural, vegitarian-fed and as always there are no synthetic hormones or additives in their feed. This is what makes our poultry and eggs so tasty! Please click our link below to see all these qualities defined. We offer a variety of cuts of meat. Call for Prices, Orders, or if you have Questions!!! Our mission is to sell only the most local and fresh produce. Far Away Farm has kept a huge garden for many years. Our family tradition is to preserve the delicious fresh produce from our farm by freezing, and canning. When our children were young we allowed them to pick and sell the extra veggies on the stand at the end of our driveway. When we bought Far Away Farms Country Corner we moved the stand with us. We met customers who had been coming to our stand for years, unbeknownst to us. In early spring we sell flowers from local growers. We buy produce that we don’t grow (ie. Tomatoes are bought in June, because our tomatoes aren’t ready until July). The summer brings baskets of green, red, and yellow bell peppers, hot peppers, eggplant, zucchini, summer squash, tomatoes, green beans, peaches, plums, and other produce. In September we sell apples, mums, asters, pumpkins, Indian corn, gourds, cornstalks and other autumn delights.